Beautiful views of the Sonoma County Coast as we ascend this very steep segment. 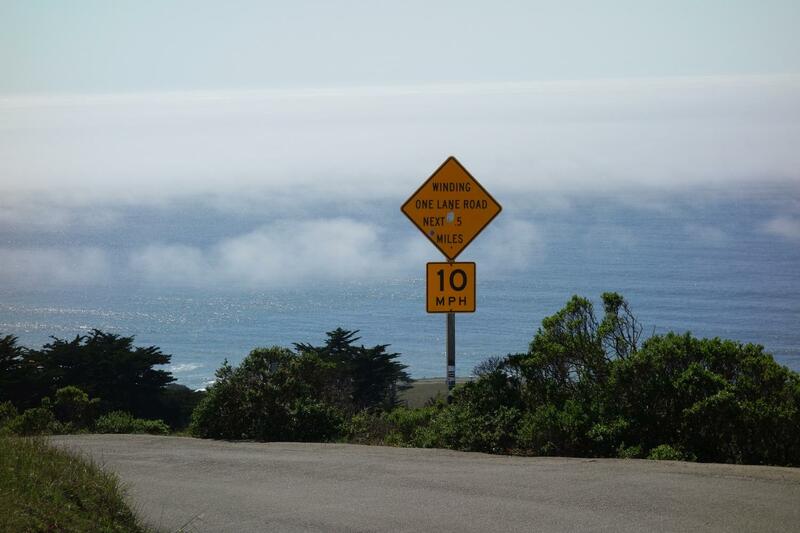 Coleman Valley Road - we climb steeply from the Pacific Coast 5 miles north of Bodega Bay. Ride 1.6 miles gaining 801’ to elevation 864’ at 9.5% average grade. This is the first leg (or last if you travel from Occidental) of one of Sonoma County's cycling jewels - Coleman Valley Road. Rivaling Kings Ridge and Geysers Road in offering the scenic beauty of Sonoma County, CVR is on our "must do" list for those living in or visiting Sonoma County. Whether you are here to wine taste, visit, or cycle, you will not regret fitting in the 10.1 miles of CVR between Occidental and Hwy 1 (20.2 round trip map). CVR is a main segment of one of the 100 mile Levi's Gran Fondo routes. The crux of Coleman Valley Road is the first 1.6 miles after turning off Hwy 1 and heading east up this epic road and climb. Looking west from the start. Through the tunnel just past the start. Exceptional views west as we climb. Finish at the cypress trees. The Coleman Valley Road bike climb begins about 2 ½ miles north of Bodega Bay (population 1,077, 2010) Sonoma County, Northern California. Roadway surface/Traffic: The roadway is in moderately good condition with no shoulder (at points it is more of a wide single lane) but minimal traffic. Coleman Valley Road, Sonoma County, has been included 4 times in the Tour of California between 2006 and 2019. Climbing Coleman Valley Road West by bike - this is one of the most scenic bicycle climbs and routes in Sonoma County. Other climbs within a 25 mile straight-line radius of the start of this climb are Bay Hill Road, Willow Creek Road, Joy Road, Meyers Grade, Summit Avenue, Harrison Grade, Old Cazadero Road (Old Caz), Fort Ross Road East, Sweetwater Springs Road west, and Sweetwater Springs Road East. Access these other climbs by clicking the "Routes in Area" button below or the climb card above right.